This Moong dal halwa recipe is a classic delicacy from North Indian, Rajasthani cuisine. 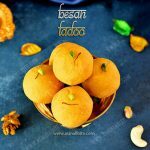 It is prepared from grinded moong dal, sugar, ghee and garnished with nuts. It is usually prepared during winter, as the mung beans keeps the body warm and it is protein rich also. 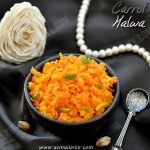 This moong dal ka halwa is prepared with the easily available ingredients in our kitchen pantry, but the time consuming part is stirring which is a test for our patience. 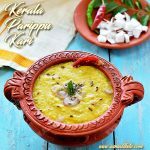 Also the more we cook the moong dal, the more it taste delicious, even no garnishing with nuts is needed, as it has an amazing taste when eaten plain also. 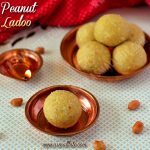 As Navratri, Diwali festivals are in a row, do try this delicious sweet and let me know your feedback. 1. 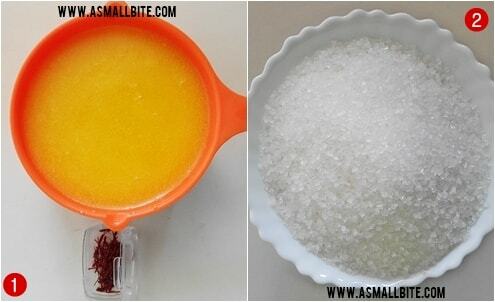 Measure ghee, sugar and keep by side. 2. Soak moong dal in water for minimum 2 to 3 hours. Rinse well and drain the water completely. 3. Transfer the moong dal to a mixer / blender and grind it to a semi-coarse paste. If required add very little water to grind. 4. Boil milk in a pan in medium flame for 5 minutes. 5. Then add sugar and once it dissolves add saffron strands. 6. 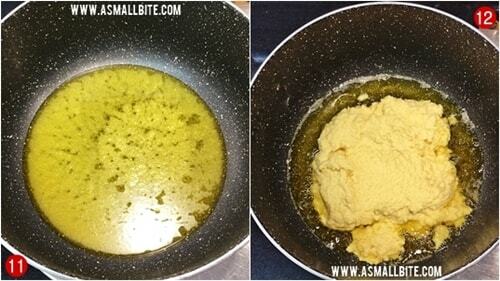 Take a non-stick pan, pour 1/2 cup of ghee and melt it. Then add the grinded moong dal paste. 7. Stir continuously for 10 to 15 minutes in low flame, first it looks like a paste, then into lumps. Break the lumps and it looks like granules or puttu. Stir till the raw smell of the moong dal leaves. The more we cook the moong dal, the more it taste good. 8. Now pour the boiled milk, stir by breaking the granules. The mixture thickens after 5 minutes, small granules is ok.
9. Now add the remaining ghee at regular intervals. Stir for a while till the ghee, leaves the sides of the pan. Switch off flame when the halwa is in slight flowing consistency itself, as it thickens with time. 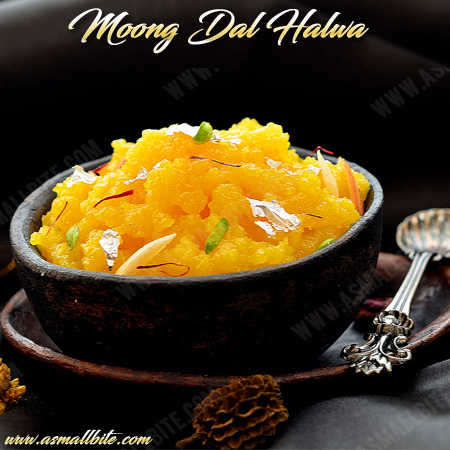 Try this Moong dal halwa for this Navratri / Diwali or even holi. 1. Use good quality moong dal and fresh ghee. 2. 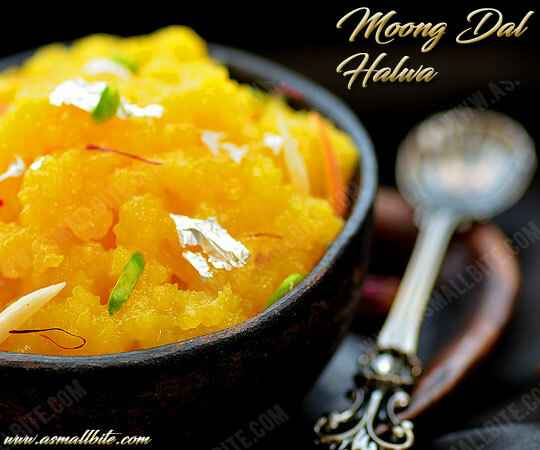 Use a non stick pan or heavy bottomed pan for this moong dal halwa recipe. 3. Don’t grind the moong dal to a very fine paste, it should be little coarse. 4. Also don’t add more water while grinding the dal, just grind it with very little water. 5. 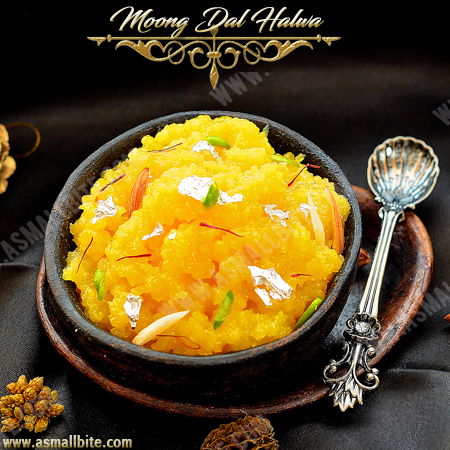 Adjust sugar as per sweetness required for this moong dal ka halwa. 6. Do the whole process in low flame and stir continuously, so the halwa don’t stick in the bottom. 7. First the halwa looks like a paste, then lumps and finally into granules. Break the granules with the ladle when stirring itself. 8. 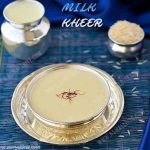 Ensure the raw smell of the moong dal completely leaves before adding milk. 9. If the halwa turns sticky, add little more ghee and stir till the ghee leaves the sides of the pan. 10. Switch off flame, when the halwa is in slightly running consistency as it thickens with time. 11. Shelf life of this halwa is 10 days under refrigeration. Just add little warm milk or heat it before serving. 12. Addition of nuts is optional, it taste good when eaten plain also.